For the modern South Asian Movement, see Ahl-i Hadith. Ahl al-Hadith (Arabic: أهل الحديث‎, translit. The people of hadith; also Așḥāb al-Hadiṯh, Arabic: أصحاب الحديث‎, translit. 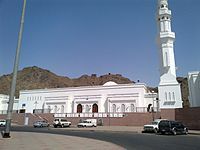 The adherents of the hadith) was an Islamic school of thought that first emerged during the 2nd/3rd Islamic centuries of the Islamic era (late 8th and 9th century CE) as a movement of hadith scholars who considered the Quran and authentic hadith to be the only authority in matters of law and creed. Its adherents have also been referred to as traditionalists and sometimes traditionists (from "tradition" as a translation of the word hadith). In jurisprudence Ahl al-Hadith opposed contemporary jurists who based their legal reasoning on informed opinion (ra'y) or living local practice, referred to as Ahl ar-Ra'y. In matters of faith, they were pitted against the Mu'tazilites and other theological currents, condemning many points of their doctrines as well as the rationalistic methods they used in defending them. The most prominent leader of the movement was Ahmad ibn Hanbal. Subsequently, other Islamic legal schools gradually came to accept the reliance on the Quran and hadith advocated by the Ahl al-Hadith movement as valid, while al-Ash'ari (874-936) used rationalistic argumentation favored by Mu'tazilites to defend most of the same tenets of the Ahl al-Hadith doctrine. In the following centuries the term ahl al-hadith came to refer to the scholars, mostly of the Hanbali madhhab, who rejected rationalistic theology (kalam) and held on to the earlier Sunni creed. This theological school, which is also known as traditionalist theology, has been championed in recent times by the Salafi movement. The term ahl al-hadith is sometimes used in a more general sense to denote a particularly enthusiastic commitment to hadith and to the views and way of life of the Salaf. The Ahl al-Hadith movement emerged toward the end of the 8th century CE among scholars of hadith who held the Quran and authentic hadith to be the only acceptable sources of law and creed. At first these scholars formed minorities within existing religious study circles but by the early 9th century had coalesced into a separate movement under the leadership of Ahmad ibn Hanbal. In legal matters, these scholars criticized the use of personal scholarly opinion (ra'y) common among the Hanafi jurists of Iraq as well as the reliance on living local traditions by Malikite jurists of Medina. They also rejected the use of qiyas (analogical deduction) and other methods of jurisprudence not based on literal reading of scripture. In matters of faith, they were pitted against Mu'tazilites and other theological currents, condemning many points of their doctrines as well as the rationalistic methods they used in defending them. Ahl al-Hadith were also characterized by their avoidance of all state patronage and by their social activism. They attempted to follow the injunction of "commanding good and forbidding evil" by preaching asceticism and launching vigilante attacks to break wine bottles, musical instruments and chessboards. The next two centuries witnessed a broad convergence of legal methodologies which gave rise to the classical theory of Sunni jurisprudence (uṣūl al-fiqh). Hanafi and Maliki jurists gradually came to accept the primacy of the Quran and hadith advocated by the Ahl al-Hadith movement, restricting the use of other forms of legal reasoning to interpretation of these scriptures. This "traditionalizing" of legal reasoning is exemplified in the work of Malik's student Al-Shafi‘i, which laid the foundation of the Shafi'i legal school. In turn, Hanbali jurists, who led the traditionalist movement and initially opposed the use of qiyas, gradually came to accept it as long as its application was strictly founded on scriptural sources. Ahl al-Hadith believed that the zahir (literal, apparent) meaning of the Qur'an and the hadith have sole authority in matters of faith and that the use of rational disputation is forbidden even if it verifies the truth. They did not attempt to conceptualize the meanings of the Qur'an rationally, accepting them without asking "how" (bi-la kaifa), and asserted that their realities should be consigned to God alone (tafwid). They believed that every part of the Qur'an is uncreated (ghayr makhluq). Ahl al-Hadith also held that iman (faith) increases and decreases in correlation with the performance of prescribed rituals and duties, such as the five daily prayers. In 833 the caliph al-Ma'mun tried to impose Mu'tazilite theology on all religious scholars and instituted an inquisition (mihna) which required them to accept the Mu'tazilite doctrine that the Qur'an was a created object, which implicitly made it subject to interpretation by caliphs and scholars. Ibn Hanbal led traditionalist resistance to this policy, affirming under torture that the Quran was uncreated and hence coeternal with God. Although Mu'tazilism remained state doctrine until 851, the efforts to impose it only served to politicize and harden the theological controversy. This controversy persisted until Abu al-Hasan al-Ash'ari (874-936) found a middle ground between Mu'tazilite rationalism and Hanbalite literalism, using the rationalistic methods championed by Mu'tazilites to defend most tenets of the Ahl al-Hadith doctrine. A rival compromise between rationalism and traditionalism emerged from the work of al-Maturidi (d. c. 944), and one of these two schools of theology was accepted by members of all Sunni madhhabs, with the exception of most Hanbalite and some Shafi'i scholars, who persisted in their rejection of kalam, although they often resorted to rationalistic arguments themselves, even while claiming to rely on the literal text of scripture. Although the scholars who rejected the Ash'ari and Maturidi synthesis were in the minority, their emotive, narrative-based approach to faith remained influential among the urban masses in some areas, particularly in Abbasid Baghdad. While Ash'arism and Maturidism are generally called the Sunni "orthodoxy", the traditionalist school has thrived alongside it, laying rival claims to be the orthodox Sunni creed. In the modern era it has had a disproportionate impact on Islamic theology, having been appropriated by Wahhabi and other Salafi currents and spread beyond the confines of the Hanbali school of law. ^ Blankinship, Khalid (2008). Tim Winter (ed.). The early creed. The Cambridge Companion to Classical Islamic Theology. Cambridge University Press (Kindle edition). p. 53. ^ Brown, Jonathan A.C. (2009). Hadith: Muhammad's Legacy in the Medieval and Modern World. Oneworld Publications (Kindle edition). p. 168. In the wake of the tenth-century Ash'ari synthesis, some Muslim theologians still maintained the strict details of the early Sunni creed. This continuation of the original Sunni thelogical School is often referred to as the Salafi school of theology [...] or as followers of 'Traditional (Athari)' or ahl al-hadith theology. ^ Agwan, A. R.; Singh, N. K. (2000). Encyclopedia of the Holy Qur'an. Global Vision Publishing House. p. 678. ISBN 8187746009. ^ Herbert W. Mason, Humaniora Islamica, Volume 1, p 123. ^ Brown (2009, p. 180): "The Ash‘ari school of theology is often called the Sunni ‘orthodoxy.’ But the original ahl al-hadith, early Sunni creed from which Ash‘arism evolved has continued to thrive alongside it as a rival Sunni ‘orthodoxy’ as well." Berkey, Jonathan Porter (2003). The Formation of Islam: Religion and Society in the Near East, 600-1800. Cambridge University Press (Kindle edition). Blankinship, Khalid (2008). Tim Winter (ed.). The early creed. The Cambridge Companion to Classical Islamic Theology. Cambridge University Press (Kindle edition). Brown, Jonathan A.C. (2009). Hadith: Muhammad's Legacy in the Medieval and Modern World. Oneworld Publications (Kindle edition). Halverson, Jeffry R. (2010). Theology and Creed in Sunni Islam: The Muslim Brotherhood, Ash'arism, and Political Sunnism. Springer (Google Play edition). Hodgson, Marshall G. S. (2009). The Venture of Islam, Volume 1: The Classical Age of Islam. University of Chicago Press (Kindle edition). Lapidus, Ira M. (2014). A History of Islamic Societies. Cambridge University Press (Kindle edition). ISBN 978-0-521-51430-9. Leaman, Oliver (2008). Tim Winter (ed.). The developed kalām tradition. The Cambridge Companion to Classical Islamic Theology. Cambridge University Press (Kindle edition). This page was last edited on 6 April 2019, at 16:53 (UTC).